History Editor is the archive to History Musings all posts from 2008 to August 2011 are located on this blog. This includes the 2008 Presidential Campaign & Election, and President Barack Obama's 1st Term & the 112th Congress From January 2009 to August 2011. American, Israeli and Canadian politics, universities and education, and Judaism and Jewish issues for Examiner.com. She is the editor of Academic Buzz Network, a series of political, academic & education blogs which includes History Musings... History, News & Politics which covers the Obama Presidency, the 113th Congress, and history news. She has previously covered the 2004, 2008 & 2012 Presidential campaigns & 2010 midterm elections. Fine Arts from Vanier College. Presidential Campaigns and Elections Reference. She has also contributed to a number of reference publications; including the overviews, and chronologies for History of American Presidential Elections, 1789-2008, 4th edition, originally edited by Fred L. Israel, and Arthur Meier Schlesinger, Facts on File, Inc. 2011, and the bibliographies for The Encyclopedia of the Cold War: a Political, Social, and Military History, edited by Spencer Tucker, ABC CLIO, 2007, and The Home Front Encyclopedia: United States, Britain, And Canada in World Wars I And II, edited by James D. Ciment & Thaddeus Russell, ABC-CLIO, 2006.
working for HNN from 2004-2010. Area of Research: Cultural and Nineteenth Century American History. 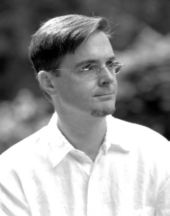 Major Publications: Sandage is the author of Born Losers: A History of Failure in America (Harvard University Press, 2005), which was awarded the 34th Annual Thomas J. Wilson Prize, for the best “first book” accepted by Harvard press. The paperback edition was published in 2006; a Japanese translation was released in 2007, and there are forthcoming translations in Chinese and Taiwanese, 2007-2008. His abridgement of Alexis de Tocqueville’s Democracy in America has just been published by HarperPerennial Modern Classics. His next book project, Half-Breed Creek: A Tall Tale of Race on the Frontier, 1800-1941, focuses on mixed-blood Native Americans to show how family folklore has shaped racial identity in the United States. Sandage is also the author or numerous journal articles and book chapters including: “The Gilded Age,” in A Companion to American Cultural History, ed. Karen Halttunen (London: Blackwell, forthcoming August 2007), and “A Marble House Divided: The Lincoln Memorial, the Civil Rights Movement, and the Politics of Memory, 1939-1963,” Journal of American History, 80 (June 1993): 135-167; reprinted in Reynolds J. Scott-Childress, ed., Race and the Production of Modern American Nationalism (Garland, 1999), 273-311; and Charles Payne and Adam Green, eds., Time Longer than Rope: A Century of African American Activism, 1850-1950 (NYU Press, 2003), 492-535. Mellon-Christian Fellowship in Business and Economic History, Virginia Historical Society, Richmond, Va., 1993, 1994. Sandage is active as a public historian, he has been a consultant to the Smithsonian Institution, the National Archives, the National Park Service, an off-Broadway play, and film and radio documentaries. In 1999-2000, he chaired a panel of historians to choose an inscription for the wheelchair sculpture belatedly added to the Franklin D. Roosevelt Memorial. He is co-editor of the “American History and Culture” book series for New York University Press. His commentaries have appeared in The New York Times, The Washington Post, The Industry Standard, and Fast Company Magazine, among other mainstream periodicals. Three days before HNN informed me of this recognition, an e-mail query arrived from a scholar writing about failure and depression – the emotional kind. Did I have any thoughts on connections between them? The truth is, such thoughts clouded much of the decade between earning my Ph.D. in 1995 and publishing Born Losers in 2005. Anyone who can count will see that gaping hole in my résumé, and anyone who knows me even distantly will vouch that I was barely seen or heard from for years. In the time span I took writing just one volume, J.R.R. Tolkien wrote all of Lord of the Rings. Historians remember each other as much by topic as by name. “Whatever happened to that failure guy?” Everybody loved my topic; it had gotten me grants and a good job. Early on, colleagues ribbed me, “If you fail to finish your book, you’ll really have succeeded, right?” When they stopped kidding me entirely, it was no joke anymore. The life crises of my thirties were no worse than anybody else’s. My 15-year relationship ended, a close friend died young, the puppy I got while writing my dissertation died old. A bewhiskered faculty mentor spun horror stories of promising historians who were denied tenure and now taught 6/6. To paraphrase my dad’s old suppertime rant: somewhere there were starving adjuncts who would just love to have my job. I found a groovy Jungian shrink who burned incense during sessions – a barefoot hippie chick who helped me a lot, and I went on meds. The book just went on. The longer it took, the worse I felt, the better it had to be. I read somewhere that Niall Ferguson was born on April 18, 1964 – same day and year as I was. Having created the monster that ate up my thirties, I managed to kill it a few months before turning forty. When my tenure case went through, my college Dean winked about “a last-minute reprieve from the Governor.” People started kidding me again. 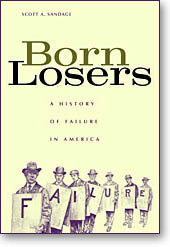 My favorite review of Born Losers opened with a blunt acknowledgement that “delays in [the book’s] appearance fanned fears that Sandage, like many of his book’s characters, might himself fail in his undertaking.” I did fail, of course, just as anyone who tries to explain the past must fail. I took too long to understand that failure was no excuse for not finishing. After discussing my depression in an NPR interview about the book, I got a lot of unexpected mail from people with their own failure stories. Evidently, it helped to know that Born Losers was not the work of some ivory professor impressed by his own success. The foregoing should raise questions about naming me to any “top” list, but I am grateful to be called “young” and happier still to feel that way again. Replying to last week’s query about depression and failure, I thumbed Born Losers and was shocked to discover that I omitted that angle entirely. Go figure.